Chiefs goalie Itumeleng Khune is blessed with many things but luck certainly isn’t one of them. When the soccer star suffered a facial fracture earlier this month the internet was quick to react and it looks like the keeper’s bad luck has struck once again. He posted a selfie on Insta looking a bit worse for wear. 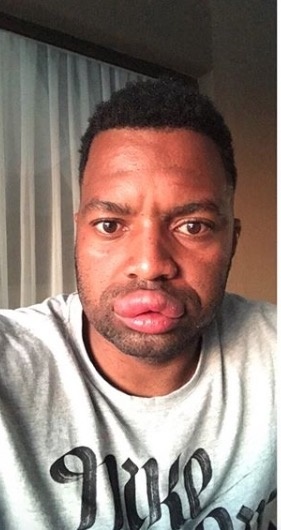 It seems Khune’s discovered he’s allergic to prawns – and he had the swollen mouth to prove it! This incident comes just as the goalie’s been making a return to the field after the unfortunate fracture – he’s already played two games without his protective mask.